Planeta Hosting Review 2019: Is Planeta Hosting a Good Hosting? Founded in 2001, Planeta Hosting is a Chilean company that primarily serves the South American region. They offer fast and reliable hosting with an eco-friendly operational base. 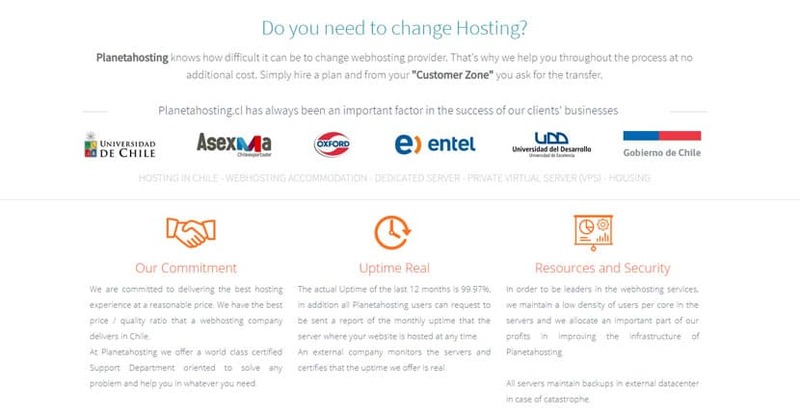 Planeta Hosting is a Chilean company that was founded in 2001. Since then, their operations have expanded to include their own data center and 24/7 call center. They target mainly a South American customer base, which includes Brazil, Peru, Bolivia, and Chile. Planeta Hosting currently hosts over 12,000 websites on their servers. In addition to these resources, you’ll get a cPanel installation and the Softaculous one-click installer with over 300 applications included. Servers run on the CloudLinux operating system, which partitions your resources on the server so that you won’t be affected by another website’s increased resource usage. Planeta Hosting boasts an average uptime of 99.97%, though there isn’t an uptime guarantee for Personal plans. They also maintain a low number of users per shared server: this is considered best practice in the industry as it helps to maintain optimal speeds even for shared server users. If you require more resources or higher levels of performance for your company, opt for their Business or Specialized Hosting plans instead. The Business plans utilize SSD storage, run on next-generation Supermicro servers, and give you virtually unlimited bandwidth. Here, they also give you a guaranteed annual uptime of 99.98%. Specialized Hosting plans are specific to two select CMSes: WordPress and WebPay. Whichever one you choose, the servers will be optimized so that your desired platform loads up to six times faster. Planeta Hosting owns and operates their own data center in Chile, which ensures quick access for all South American visitors. They’ve also partnered with another data center in the United States. All server data is backed up daily and stored for up to a month, so you can rest assured that should your website suffer any lapse in security, you can easily restore everything. As an extra perk for eco-conscious individuals, every plan you purchase with Planeta Hosting, they will also contribute to the regrowth of the Chilean forests, which were devastated by a series of fires in 2017. You even get to name the tree that you’ll be helping to plant, and you can check out how it’s doing with the coordinates that they send you. Note that the prices listed on their website are annual rates, so don’t be alarmed if it seems larger than normal! That said, I did find their prices a bit high for the resources given, even for their Personal plans. On top of that, they don’t include a free SSL certificate in any of their plans – even the Business or Specialized Hosting ones. This is a huge minus given today’s SEO landscape. There are no free plans or trials. They claim to have a 30-day money back guarantee: this required quite a bit of digging to uncover though, so it’s unclear whether it’s applicable to all of their plans. You can contact their support team through their online chat or telephone number. Unfortunately, their live chat is only available during business hours, so you’ll have to call them if you want more immediate support. You can also send in a ticket after logging into your hosting account or check out their fairly comprehensive FAQ section or their few video tutorials to see if they’ll resolve any of your questions. Note that all of their help documentation is written in Spanish, and you’ll have to be able to communicate in the language to speak with their representatives. Planeta Hosting’s plans are decent for individuals or small to medium-sized businesses, but not recommended for those running e-commerce websites. Wondering how Planeta Hosting stacks up against other Web Hosting companies? Enter any other Web Hosting company and we will give you a side-by-side comparison.